How do I add Google Sitemaps for my online store? Pulse Commerce provides a Sitemap Generator to help you automate the process of creating a Google Sitemap. The Sitemap Generator generates a sitemap file for your Pulse Commerce store as per XML Sitemap Format specifications. The sitemap file is a way of telling Google about your site’s structure and will enable easier indexing of the site by Google. This sitemap is for non-product pages and custom content pages that are not direct product pages. You will need to generate both of these types of sitemaps. Click on each sitemap link to access the respective sitemap. Note: You should either use either the Product and Product Group (No Child SKU's), OR the Product (Child SKU's) product sitemap, in addition to the Category & Custom Page sitemap. In almost all situations, the Product and Product Group (No Child SKU's) sitemap is the correct choice. Note: For product sitemaps, you can either download a sitemap with URLs only, or a sitemap with image paths as well. This choice depends on your business model and preferences. Download the sitemaps to your local computer. Review the sitemaps, editing as needed. 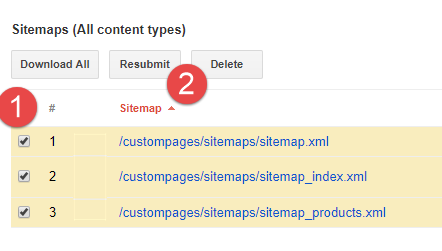 Sitemaps should be located in the /custompages/sitemaps/ folder, and should have the corrected names from the previous step. You should overwrite the existing files with the new sitemaps of the same names. If the names do not match, you should rename your sitemaps to the sitemap names in the /custompages/sitemaps/ folder. This file is an index file to show where your sitemaps are. All you need to do is update the date/timestamps to reflect the latest changes. Note: If you change your sitemap names you will need to also change the paths in this file. 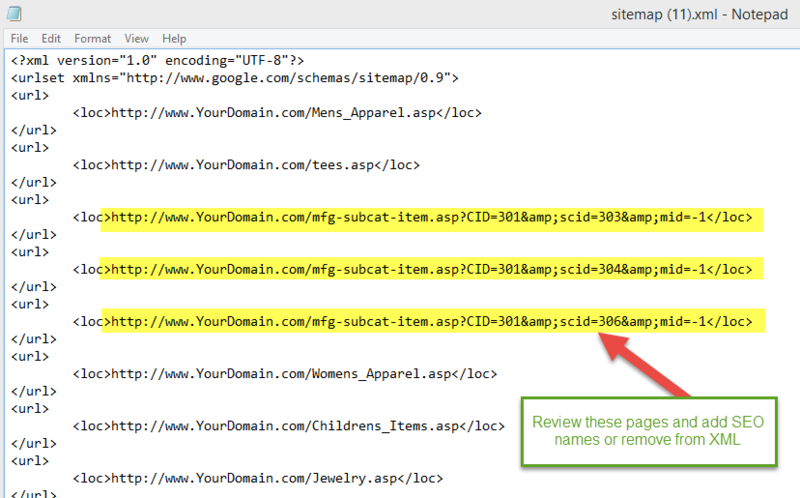 Ensure the sitemap, sitemap_products, and sitemap_index XML paths in Google Webmaster tools are correct. Sometimes your sitemap submissions may contain errors. If so, investigate the error pages, and resolve the issues so your site does not have any bad datapoints. The Product (Child SKU's) sitemap, and the Bing and Yahoo sitemap formats exist in case you need these formats for some (non-sitemap) purpose. The Google sitemap format is the standard sitemap format. Even Yahoo and Bing use it.